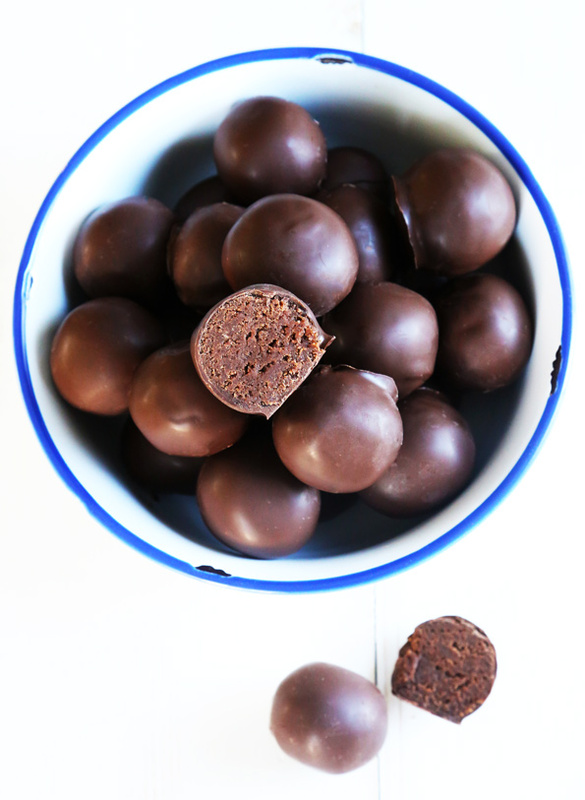 Gluten Free Rum Balls | Great gluten free recipes for every occasion. It’s coming! The New Year. It’s coming. Now I haven’t seen midnight on New Year’s Eve in approximately 100 years (I never was one for big, splashy parties), but as a dyed in the wool morning person, I do love a fresh start. So the “eve” isn’t really for me, but the day? I’m all for it. Either way, this is a big wide world, filled with all kinds of people. 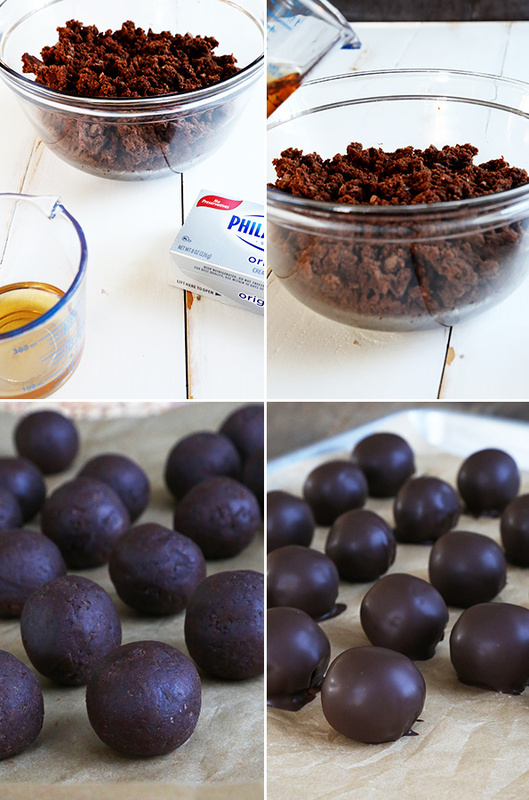 I submit that these gluten free rum balls (don’t worry—I have tips for making them alcohol-free, which means they’re not really rum balls but why quibble?) are for all sorts, whether you love the “eve,” the “day” or just can’t wait for this whole mess to pass so we can get on with it. They’re super easy to make (it’s basically a moist brownie baked to be crumbled, kind of like a cake pop), rich and deliciously chocolatey, and undeniably festive. Did I mention that they can be made in stages—and way ahead of time? You can really use any of my gluten free brownie recipes for the chocolate-cake base you crumble up (you could even make them grain-free if you use my Super Fudgy Paleo Brownies), but the recipe as written is the way I’d go (well, the way I did go). 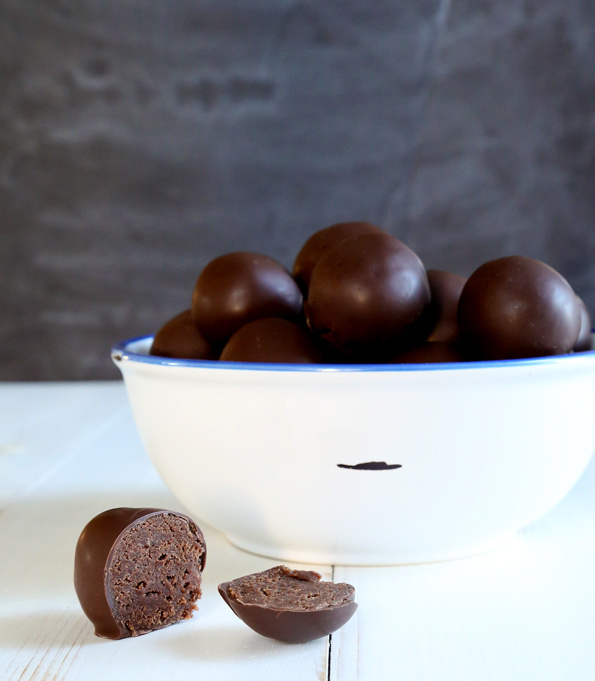 It makes for the softest, most moist centers that hold together in rum balls like they were born for it. The steps are dead simple, but I thought you might like to see what they look like crumbled up, then rolled into balls before they’re dipped in chocolate. Now unlike my gluten free rum cake and my gluten free champagne cake, none of the alcohol in the rum in this recipe is heated, so none burns off. For me, that means these were completely off-limits for my children (pout all you want kids, but I won’t budge! ), and of course if you’re in recovery or making them for someone else who is, these wouldn’t be appropriate. But I’ve got plenty of suggestions for how to make them alcohol-free, which really makes them into just brownie cake-balls but I can’t imagine anyone would be complaining. More easy-but-festive New Year’s treats to come this week. The rest of the Internet may be kinda quiet, but we’re open for business here! *Pure rum, without flavorings or additives, is gluten free. You can use anything from dark rum to light rum, depending upon your taste preference. If you would like to try to make these rum balls completely alcohol-free, try using water in place of the rum in equal measure, but add a fair amount of rum extract. As always, feel free to experiment! First, make the rum balls. Preheat your oven to 350°F. Line a half sheet pan (13-inches x 18-inches x 1-inch) with unbleached parchment paper, and set it aside. If you don’t have a half sheet pan, use any shallow baking pan(s) with low sides so you can spread out the batter into a layer about 1/2-inch thick. If the pan is not large enough, try using multiple pans. In a small, heat-safe bowl, place the chopped chocolate and butter, and place over a pan of simmering (not boiling) water, making sure the bottom of the bowl doesn’t touch the water. Stir occasionally until melted and smooth. Remove the bowl and set it aside to cool briefly. Add the sour cream to the melted chocolate mixture, and mix to combine. In a large bowl, place the flour blend, xanthan gum, salt, and granulated sugar, and whisk to combine well. Create a well in the center of the dry ingredients, add the eggs and vanilla, and mix to combine. Add the melted chocolate and butter mixture, and mix again to combine. The batter should be thick but smooth. Scrape the batter onto the prepared pan and spread into an even layer about 1/2-inch thick with a wet spatula. Place the pan in the center of the preheated oven and bake just until set in the center, about 13 minutes. Allow to cool in the pan for 10 minutes or until no longer hot to the touch. Line a separate rimmed baking sheet with unbleached parchment paper and set it aside. Crumble the cooled brownies into a large bowl. Add the cream cheese and the rum, and mix to combine. The mixture should hold together well when squeezed in your hands. Divide the mixture into 24 portions and roll each tightly into a ball between moist palms, each about 1 1/4-inches in diameter. Place in a single layer on the prepared baking sheet and place in the refrigerator to chill until firm (about 45 minutes—or if you’re in a rush, try the freezer for less than 10 minutes). Once the balls are firm, prepare the chocolate glaze. In a medium-size bowl with high sides, place the chopped chocolate and coconut oil and place the bowl over a pan of simmering (not boiling) water, making sure the bottom of the bowl doesn’t touch the water. Stir occasionally until melted and smooth. Remove from the heat and allow to cool until the mixture just begins to thicken. Dip the rum balls: Immerse one rum ball in the chocolate mixture by pressing it down with a dipping tool or fork, flipping it over in the chocolate, and removing the rum ball with the utensil by slipping the utensil under it and bobbing the rum ball on the surface of the chocolate a few times before pulling it along the edge of the bowl to remove any excess chocolate. 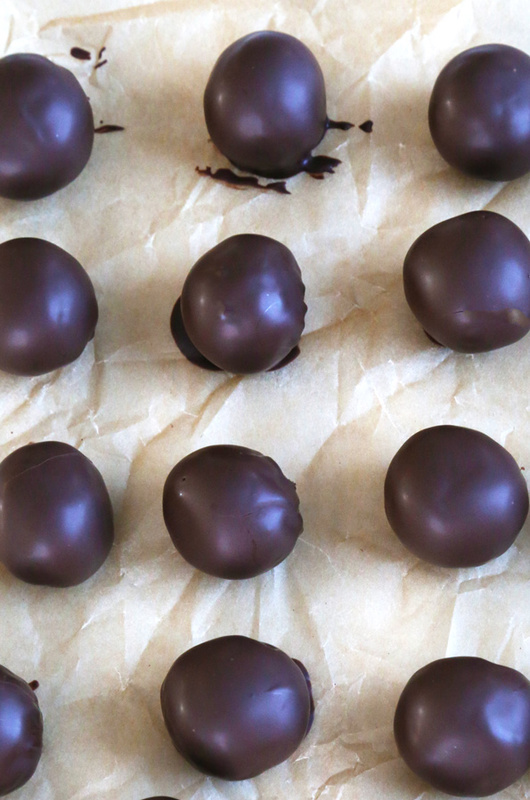 Place the chocolate-covered rum ball back on the prepared baking sheet. Repeat with the remaining rum balls, and allow to set at room temperature until the chocolate glaze is set. Store at room temperature until ready to serve. The chocolate glaze will keep the rum balls fresh for at least 3 days. P.S. Now that the holidays are over, which Gluten Free on a Shoestring Cookbooks do you have?! Why not round out your collection by preordering the new book, Gluten Free Classic Snacks?! Thank you thank you thank you! I’ve never had a rum ball! Now I can! Happy new year! I have to ask…have you tried these with something other than rum? It’s just that I have this partial bottle of Amaretto on the counter that I’d like to make disappear…and was thinking almond extract instead of vanilla…and perhaps some chopped dried cherries? Inside or out? Wow…..I guess I MUST try this now that you made me daydream! Thanks a lot, Nicole!!! My “pre” gluten-free Rum balls were make with rum and Coke. How changing the liquids to rum extract and the remainder room temperature Coke (or Pepsi – your preference)? I don’t see why that wouldn’t work just fine, Judy! Mmmm brownies with rummmmm. I love how simple these sound! They are definitely simple, Lauren!